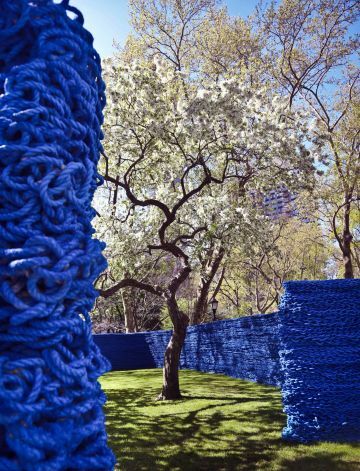 New York, NY - A New York City artist has lassoed a small public park, creating a whimsical landscape of bright red, yellow and blue enclosures out of recycled lobster rope for visitors to explore. Using miles of the thick and rigid rope from old lobster traps, Genger uses a crochet stitch to give it a braided look, then paints, twists and stacks the rope before wrestling it into intriguing and continuous shapes. In one area of the 6.2-acre park, a red undulating wall spills out on the grass. In another, the rope creates a blue, hedge-like feature. Elsewhere, tall waves of yellow form a pleasing space that cascades at one end like spilled water — or paint. The rope looks a bit like chainmail, some of it winding around the blossoming trees. 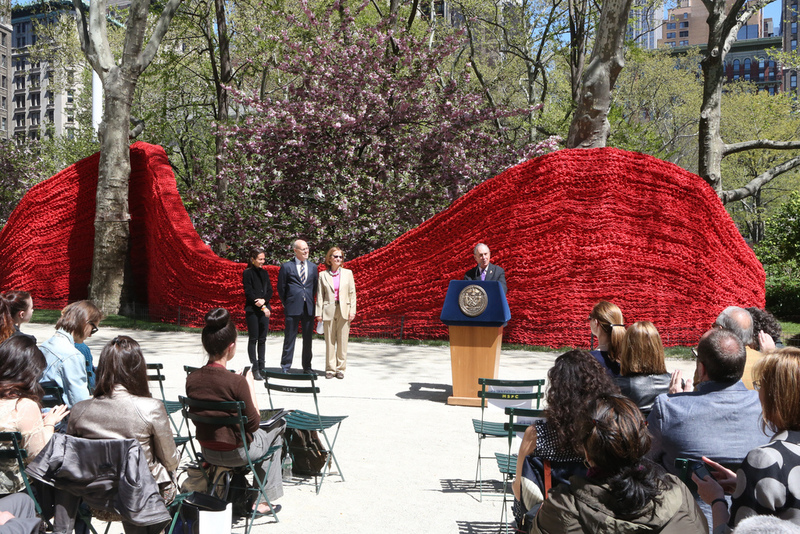 Genger “takes the domestic art of crocheting to a masculine level,” said Madison Square Park Conservancy President Debbie Landau, noting that Genger uses only her hands to create the shapes. The labor-intensive installation required 1.4 million feet of rope weighing 100,000 pounds. It took 9,000 hours of labor and 3,000 gallons of paint to transform the dull rope into a vibrant material. It comes from a lobster foundation in Portland, Maine, that recycles nautical rope from all along the Eastern Seaboard, which is unusable after a year, so it doesn’t damage the environment, Landau said. “Red, Yellow and Blue” is Genger’s largest installation to date. 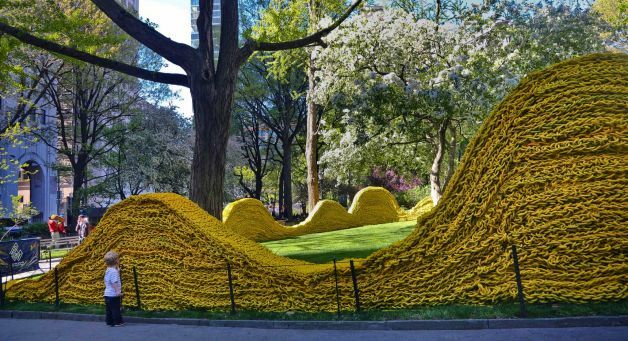 “The energy you have in the city and coming across these kinds of surprises is wonderful ... especially since it coincides with spring,” said Beatriz Cifuentes, 38, a graphics designer and photographer who lives in Queens. The site-specific installation was commissioned by Mad. Sq. Art, a program of the park conservancy. It runs through Sept. 8. In October, the work will travel to the deCordova Sculpture Park and Museum near Boston where it will be refigured for that space. The article didn't clear up that "Lobster Rope" is not made from lobster and is kosher to touch. You can't touch a lobster? I must have missed that day in cheder. Why does enlightened-yid try to make new halachos. Just like נחש with חוה. very pretty, but do the mosquitoes and rats live inside this? i'm always amused at the deep,deep meaning and factoids art mavens ramble on about these things.